Malware protection, can be achieved in many ways but more-often than not it will fail. This happens mostly to computer novices who don’t know the measures they need to take for the best malware protection. Most of the time new computer initiates have a hard time using a fully operational computer. Malware protection requires in depth computer knowledge to be able to protect a computer. Usually people think that if they have a realtime malware scanner will be enough to be fully protected. Malware protection is never accomplished 100% but we try to be as protected as possible with all kind of methods. The malware protection methods differ from person to person but the first one is prevention. Preventing malware from intruding the computer is both an active and a passive method. On the passive method you can have a realtime malware scanner installed on your computer, and that is usually not free, then you can sit idly by and hope for the best. The active method is to stay off the suspicious websites, enhancing your web browser’s security settings, having a virtual machine just for browsing the internet or suspicious sites, or you can use a Linux machine for that matter. Of course that if you blend in the active and the passive method for malware protection then you should be pretty safe, but you will not be invulnerable. Spyware designers try to outsmart everyone and design their malware to trick the users and maybe technicians well into believing that the message they have received is a genuine message. You can check this post on fake antivirus to see how a a clever malware could present it self. Once you get infected your windows malware protection got compromised. There are many ways to approach this, but usually it requires time. You could try initially from the same user profile to freeze the offending process with Process Explorer and then find it’s location. While the offending process it is frozen, then you can start a malware scanner to scan the entire machine. Most of the time the malware it self suppresses the malware scanner or any other program to prevent you from deleting it (even Process Explorer). 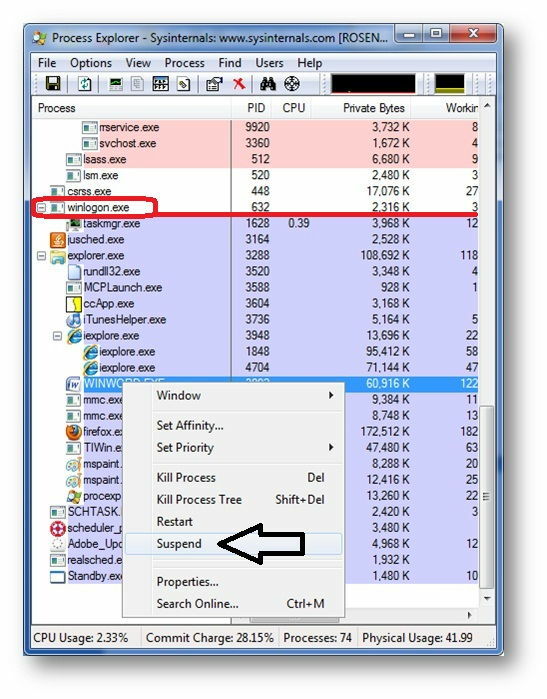 If you cannot run Task Manager then you could try Process explorer. Process explorer is a task manager on steroids. Then you can see which process is the offending malware and suspend it like in the image below. Usually the offending process is CPU intensive and you can organize the view by the CPU usage. In addition you can see that the processes with a light purple background are processes run in user mode, and the rest on the light pink background are ran in machine mode or in service mode. Usually you will find the offending malware amongst the user mode processes but is not absolute rule of thumb that all malware will be amongst the user processes. After you have suspended the offending process you can check it’s proprieties to see where is the actual file residing on your hard disk. Then you run a antispyware program to clean the computer of any other malware. But the suspended files you have to delete manually, after you have preempted or killed the processes. You want the spyware scan to eliminate all the other settings related to this adware before you kill it, because the settings placed by it will start it back up if you kill it before eliminating all the settings. In addition you could delete all the cached system restore points, and disable it. It is not a great solution but it’s safer. Or you could just leave them as they are, because not all of them are that well designed to restore themselves from system restore. So you wait for the spyware scanner and then you kill the process and delete the files then you restart the computer. If you log back in and your desktop is all messed up and you can’t click the icons then the damage is done, and you have to replace your user profile with a new one, and copy the favorites links manually. And then you still have to rescan the computer, but this time is better to use a malware boot cd and make sure you delete everything you might find. If you want to know more about user profiles and how to work on them go to the computer manual contents and see the links there. So this is one of the techniques for windows malware protection. You can definitely find more information online which will have other methods as well. You should always be vigilant regarding adware removal because these spy programs can collect sensitive information about you and you don’t want to wake up one morning and realize you are an identity theft statistic.